Muscoloskeletal Injuries (MSI) or Musculoskeletal Disorders (MSD) means an injury or disorder of the muscles, tendons, ligaments, joints, nerves, blood vessels or related soft tissue including a sprain, strain and inflammation, that may be caused or aggravated by work. Commonly known as Computer Injuries, MSDs include repetitive strain injuries and back pain, and posture disorders. 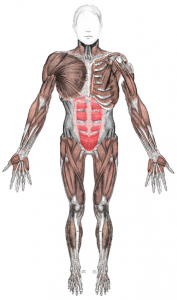 What is the musculoskeletal system? The musculoskeletal system is an organ system that enables the body to move through the use of the muscle and skeletal systems in combination. MSD occurs when part of the musculoskeletal system is called on to work harder, stretch farther, impact more directly or otherwise function at a greater level than it is prepared for. The initial impact to the affect area may be minute, but it can easily cause damage and great discomfort if it occurs repeatedly. It is the build-up of this trauma that causes the disorder. How do work-related MSDs develop? Work-related MSDs develop from repeated stress and strain to the body’s muscles, tendons, ligaments, joints and nerves. The back, shoulders, neck, arms and hands are most commonly affected. This worksheet may be useful to the Joint Occupational Health and safety Committee (JHSC) or OH&S Worker Representative at your work site to identify whether there are risk factors present. What are some diagnoses of MSDs? Examples include: tenosynovitis, tendonitis, bursitis, hand arm vibration syndrome, epicondylitis, “tennis” or “golfer” elbow, carpal tunnel syndrome, cubital tunnel syndrome, radial tunnel syndrome, thoracic outlet syndrome, and trigger finger. What are Repetitive Strain Injuries (RSIs)? A repetitive strain injury are injuries that may affect the arms, from fingers to shoulder, and neck. Also, the term RSI is often used interchangeably with MSD. What are some examples of RSIs? Passageway through the wrist is restricted and the nerves in that area are compressed. Tendon inflammation resulting from repetitive work, such as uninterrupted typing, can cause carpal tunnel symptoms. Carpal tunnel syndrome symptoms usually start gradually and can include numbness or tingling in thumb and fingers (not including little finger), discomfort in wrist and palm of hand, electric shock sensations, symptoms may radiate from wrist up arm, weakness and loss of control in hand/fingers. Inflammation or irritation of the tendon causing pain and stiffness in the affected area. Results from repeated use of the tendon. Symptoms of tendinitis tend to occur at the point where a tendon attaches to a bone and include pain or a dull ache, especially when moving the affected limb or joint, tenderness, mild swelling. Attributed to small tears of the tendons that attached forearm muscles to the arm bone at the elbow joint. Symptoms tend to develop gradually over time. Symptoms of lateral epicondylitis include pain or burning on the outer part of your elbow, weak grip strength, and symptoms are worsened with forearm activity. Symptoms of medial epicondylitis include pain along the inside of your forearm to wrist (on the same side as your pinky finger), pain when flexing your wrist, palm down, pain when shaking hands, weak grasp, and numbness and tingling from your elbow into your pinky and ring fingers. What are back pain disorders? Back pain disorders affect the muscles and skeletal structure in the upper, middle and lower back. This includes spinal disc problems and muscle and soft tissue injuries. Neck pain can be caused by many factors, including old injuries, awkward postures, repetitive activity, etc. A common cause of this is incorrect position of your computer monitor. What are my employer’s obligations to help prevent MSIs? The employer has a legal obligation to provide a safe and healthy workplace including eliminating or, if not practicable, minimizing the risk of MSIs to employees. This is not only a general requirement under the legislation, the Worker Compensation Act (WCA), it is covered explicitly in more detail by the OH&S Regulation and related WCB Guidelines. What should I do if I think I am experiencing MSI? If you’re experiencing MSI and you think it may be work-related, this is an identified risk factor and should be reported. Go to First Aid as soon as possible and document it. Report it to your supervisor and ensure the Joint Occupational Health and Safety Committee (JHSC) has received the report. What happens after I report MSI? Once reported, the OH&S Regulation is triggered and the employer MUST ensure that the risk to workers is assessed. Who conducts the risk assessment? The risk assessment will be completed by a person who has a good understanding of the work processes involved, the physical demands of work tasks and the factors which influence them, and the methods for performing a risk assessment. A handy worksheet for risk assessments can be found here. There are independent, ergonomic specialists that can complete risk assessments. In conducting the risk assessment, consideration must be given to the physical demands of work activities, aspect of workstation layout and condition, characteristics of objects handled (including if they vibrate), environmental conditions (including illumination), work-recovery cycles, task variability and work rate. What happens after the risk assessment? The employer MUST eliminate (or, if not practicable, minimize as much as possible) risk of MSIs to employees WITHOUT DELAY, implement interim control measures if permanent measures will be delayed. The employer MUST monitor the effectiveness of changes made to the workspace to ensure the risk of MSI is eliminated or minimized significantly. The employer MUST consult with the JHSC (or OH&S worker representative) regarding the assessment of MSI risk, employee education, and evaluating workplace changes. The employer also MUST consult with employees who are experiencing MSI symptoms and a representative sample of employees who actually do the work in question. This includes interviewing employees and looking at reports to First Aid, etc. Do I need to keep a record of my symptoms? Remember that the best evidence about experienced pain and symptoms comes directly from the employee, so the more accurate and descriptive the better. What should I ask the doctor for in terms of evidence when I am undergoing medical treatment? Make sure your doctor is taking thorough, accurate notes and documenting all your symptoms and observable limitations in all areas of your body. If your doctor’s opinion is that your symptoms are a result of work activities, ask your doctor to note that down with the reason(s) why they have this opinion. If your doctor isn’t sure about the specific diagnosis, ask them to refer you to a specialist through the regular Medical Services Plan system as well as through the WCB. Basically if doctors submit a request to the WCB for a specialist referral, it may be denied or ignored and your doctor may waste crucial healing time thinking that the WCB will approve the referral. How does this all work in relation to WCB Claims (Compensation)? Generally, the WCB adjudicates MSI injuries as “Occupational Diseases” (adjudicated under section 6 of the WCA) which means the condition/diagnosis is due to the nature of work activities and was not caused by a single incident or a distinct and separate series of incidents (which are adjudicated under section 5 of the WCA). The legal test for causation (and compensability of a condition) is whether the work activities played more than an insignificant and trivial aspect of the development of the condition. So, even if there are other things that may have played a role in causing the condition, if work activities also played a causative role, it should be compensated by the WCB. Generally the WCB denies these claims so don’t be surprised or defeated if your condition/diagnosis is denied. Usually the denial is based on a WCB “medical advisor” opinion, so to support an appeal you may likely need an independent medical-legal opinion to counter the WCB “medical advisor” opinion. What do I do if my claim has been denied by the WCB? If you don’t agree with the WCB decision, appeal it all the way to the Workers’ Compensation Appeal Tribunal (WCAT). Don’t end your appeal at the Review Division and know that the Review Division may send the matter back to the WCB for further investigation. Tell all your friends and family in case their claims are also denied by the WCB. Be aware of deadlines! There is a 90-day deadline to file a Request for Review (start of appeal) to the Review Division. There is a 30-day deadline to file a Notice of Appeal to WCAT from a Review Division decision. These are strict, concrete deadlines that are extremely difficult to get past. One of our members who works at a computer for most of the day complained to the employer about hip and low back symptoms she was feeling after being at work. She believed it was because the chair at the new office location they had moved to didn’t fit her properly. When she sat back in the chair to use the lumbar support, the back of her knees hit the edge of the seat and her feet couldn’t reach the ground properly. She was also moving around quite a bit on the chair to work in a pretty small, cramped work area. Her hip pain worsened over the course of a year and she asked her employer if she could get a new chair. Her employer denied the request, explaining that they had moved to a new office with new, ergonomic chairs. She asked to pay for her own new chair and bring it in but her employer again denied the request, stating that all of the chairs matched and this had to be maintained. The member’s pain increased to the point she wasn’t able to keep working and she went off work and filed a WCB claim. The member contacted me about the issue and I contacted the Joint Occupational Health and Safety Committee (JHSC) worker rep Co-Chair and advised her to write a written recommendation to the employer requesting that the member be provided with an ergonomic assessment in light of the continued symptoms. Because the member has already reported the pain and asked for a new chair and was denied, the employer had ample opportunity to assess the risk and eliminate or significantly minimize the ergonomic issues. Now, the member was injured and off work. The employer ignored the written request and because no reply was received within 21 days, a WCB prevention officer was called and attended the work site. The employer was told that an investigation must be done and that they should be assessing the ergonomics of the member’s work station. Finally, after over a year of trying to get the employer to fix her work station, the employer has agreed to have an ergonomist attend the work site, assess the member, and recommend changes. This is an important story because this employer is particularly egregious when it comes to communicating with the union. They regularly ignore requests but in this case directly because of the OH&S law in B.C., the employer had no choice but to respond – because it is the law and they have a duty to provide a safe and healthy workplace, including ensuring work stations are ergonomically sound. Visit the WCB Ergonomics Portal here.